Welcome to the Building page! 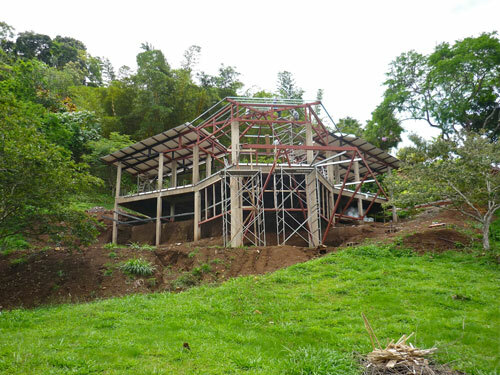 This is meant to give those interested in the theme a few insights into starting the process of building a house in Costa Rica. Basically, it is our experience, which is also pretty much the average experience. We wanted to do the administration, supervising of the building, payment of workers, buying of materials, and delivery to site ourselves. This is, of course, a full time job. 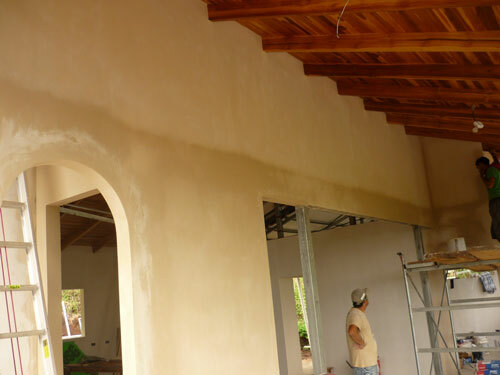 The idea of undertaking this is that we could save some money on the whole project, and make sure we got what we wanted when all was completed. 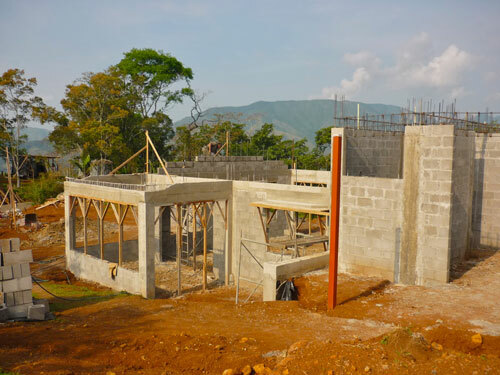 This was possible for us because firstly, I've had a good deal of construction experience in the past, both here in CR and in other countries, and secondly, we have a very useful level of fluency in Spanish. But without those two factors strongly represented such a project could easily devolve into a nightmare. We've witnessed this firsthand a number of times here in Costa Rica. I recently had a talk with a friend who recounted this story of her building experience...She and her husband entrusted the construction of their house, which is a very special design, to their architect. 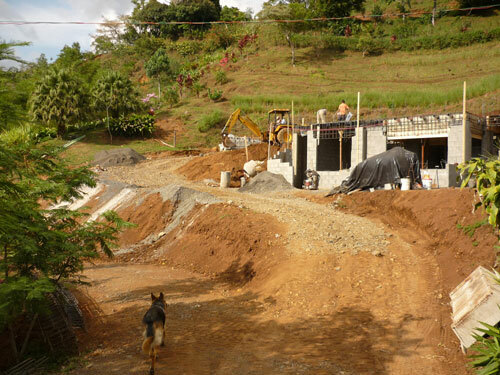 This is a service architects often provide in Costa Rica. They were present for the construction up to a point where floor tiles were needed. They chose the tiles, ordered them and then left the country for some months. When they came back they discovered, among other things, that their architect had taken a liking to their floor tiles. So much so that he actually took a large number of them to a house of his own and installed them there, believing that my friend could simply order more. Turns out she could not. There was a delay of two months while she tried to get this straightened out and finally she had to choose tiles of a different type to complete the floor! I was shocked that a highly paid professional supervisor would simply help himself to a client's materials like that. But it happens. With regard to delivery of materials to site: if your builder is responsible for buying and delivering materials, it opens up the possibility for all kinds of wheeling and dealing in the background. If you don't personally count what arrives on the truck, and do so visibly for all to see, you may start to find that there is less arriving than you ordered and paid for. 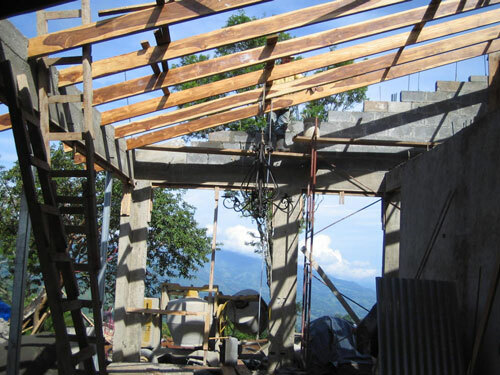 Our experience so far in building, including watching other people go through the process, is that you must have someone you can trust on site to do the detailed supervision, or do it yourself. No other way around it! A site guard who is not known to the crew but is known to you and trusted by you is also a must. This guy sleeps on site and makes sure no theft occurs during the night, and may also check the worker’s bags as they leave for the day. This is not a cost normally included in any estimates you might get. Where does one start with this whole process? Usually with the design of your house, and this will depend on the building lot and its aspect. What views there are, where is the flat bit (we live in steep mountains, after all), sunrise and sunset, space for septic tank and leach field. But in Costa Rica there is a prior consideration to design. Given that we live in a geologically active area (reputedly some 600 tremors a year, a few big ones and lots of small ones! ), and saturating rain in the wet season, a soil test is a good idea to check that it is actually safe to build on your lot. 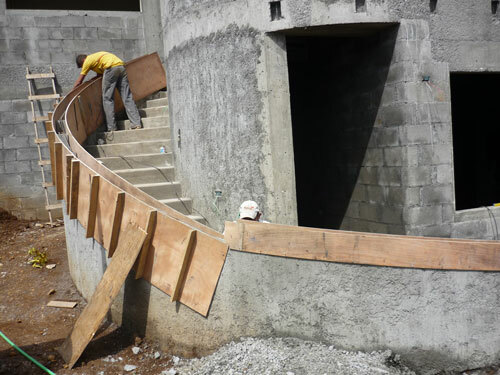 The Ticos don’t normally do this, and your contractor, and perhaps even your architect, won’t suggest it either! This will cost about $600 and will provide you with two trial bore holes up to a depth of 5 meters (16.4ft. ), and a soil drainage test to look at leach field potentials. For an extra $100 you can get a summary in English. There are two big companies here which provide this service. It's easy to set this up; just a phone call to a sales rep of the company, deposit the fee in their account at one your local banks, and fax or scan the receipt to them. You'll also need to fax the company a copy of your plano catastro (official survey plan showing geographical references and lot boundaries). Plan on a one to two week wait after payment until they arrive on site, and another two weeks to produce the report. Nothing moves quickly in Costa Rica. So once all that is tucked away you can focus on the next step, which is house design. There are various levels of house design, ranging from a standard and simple one to custom. Custom, of course, involves greater time and expense. So, let's see if we can get a handle on some sort of timeline. Working out a custom design for your house can take a long time. If working with an architect, they will need some time, usually weeks, to come up with a concept sketch of your verbal description. If the site is challenging, it is worthwhile to stake out the proposed house outlines to get a visual sense of how it sits on the lot. There will be at least a month of discussion with the architect on features and room dimensions, until things look settled enough to produce a preliminary set of drawings with dimensions and details. Now, having arrived at a design, to get to the point where you can actually get some kind of price for it, there is still a lot of work to do (which translates into time to invest). 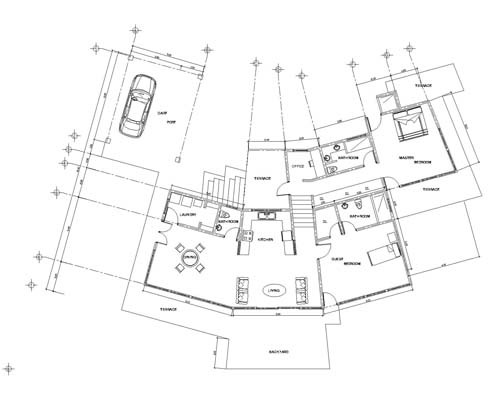 A contractor will ultimately need a detailed drawing to work from, most importantly including what finish materials will be used, in order to give a quote on the work. You need to think about ceiling materials, walls, paint/stucco, floor finishes, door and window materials and finishes, type of glass for windows (thickness, tint, tempered, reflective), hardware for doors, layout of cabinetry for kitchen, countertop materials, any stair material and design, roof materials, kitchen, shower and bathroom fittings, and electrical switch and outlet locations. This latter is most important because when using concrete block, the boxes and conduit are installed as the wall is built. Changing or adding to the plan later on is a messy business of hammering out a channel in the concrete block. Doable, but you lose time and momentum, and pay additionally for every new box installed. The architect will probably need at least a week after all these details are defined to produce some working drawings. An interesting aspect of working with an architect here is that many of the old school don't have training with computer programs such as Autocad. This makes it laborious to produce 3D drawings of a building - it can take up to three weeks to produce a set of hand drawn sketches. Some avoid this problem by farming out the data entry to an architectural student, who then produces the programmed drawings from the software. This is what my architect has done, but it has some distinct drawbacks. Each week I had a meeting with the architect and engineer team to review details of the house plan. Each time the meeting went well and they impress me with their knowledge, ideas and sense of proportion and so on. In other words, with their professional abilities. Well and good. But then what happened is that they sent the diagrams and sketches with all the notes of changes on it to their low paid student to enter into the Autocad software. Our architect, as mentioned earlier, is old-school - no software expertise. Our engineer has, but this kind of data entry is beneath him. So they hire this fellow to do the painstaking, boring stuff (he happens to be, as is so often the case here, a family member of one of them). He is also an architectural student. But he always, but absolutely always, produced something with changes unwanted and unasked for, or details clearly delineated on the original sketch but left out on the new production. Just sloppy work, typical of a student with other things on his mind. I suspect what happened was they simply dropped off the work at his home with no communication, no discussion, and most certainly no direction from them. And when they got the revised plans back from the draftsman, they print them out and then basically shelve them. Didn’t even look at them, not once. They looked at them for the first time when I walked in the door for the meeting! They were entirely unconcerned with the impression this made on the client, as the client (me) pointed out all the obvious and really sloppy errors presented. This didn’t bother them at all! Strange way of doing business... if I didn't make the obvious corrections they won't say anything...I wonder what happens to a client who can’t read plans? All in all, very frustrating and an enormous time-waster. So I insisted that the student meet with myself and the architect on site, so that he could see the needs and lay of the land. This gave him a profound orientation of what he was drawing in relation to the surrounds, so it was no longer an abstract exercise in data entry, but something real and solid. As well, he was also present for the actual discussion of relevant changes, which now have meaning for him. This all contributes to streamlining the process of getting the drawings done (correctly!). The house design we were working on is admittedly not an easy one. It’s meant to complement the terrain and fit in with it. Since the house wraps around the lines of a hill, the angles involved for each segment are sort of pie shaped wedges. As the house is on two levels, with different directions of roof slope, there is an added complication of where these lines actually intersect. The plan the architect produced was taken directly off our concept drawing, and using the dimensions as shown as well. Somehow this was not quite grasped conceptually, and he produced rooms in the form of parallelograms, an essentially unworkable (and unliveable - I get dizzy just thinking about it) design. So, after yet another meeting, he went back to the drawing board with the idea to convert the rooms into pie shaped segments as originally intended. OK, but we had now tortuously neared the target, and in two more weeks they produced a large size preliminary sheets complete with engineering details, sufficient to take to some contractors for pricing. 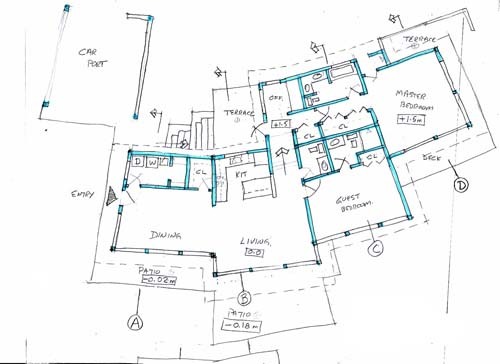 The idea of the drawings from the architect's point of view is to allow the client a last review of everything before they are submitted to the College of Architects and Engineers. Once this happens the College then prices the building, and based on that price the local Municipality will fix their fee for issuing a building permit. The workers’ risk insurance, compulsory for the permit to be issued, is also based on the College's estimate. The College's process will take a week or more, and then the plans come back with their cost estimate written on them, along with their official seal. Usually it is at this point you go looking for prices from contractors, and to the local Municipality to apply for the permit. I used the preliminary drawings for pricing purposes as I wanted to speed up the process. So while the plans were with the College I went around with prelim drawing in hand to contractors to get some prices. To help with this I made a list of the work I wanted them to include in their quote, so everything was well specified in an eventual contract. When the plans come back from the College, they come with a costing price attached. This is final, inasmuch as you can’t appeal it. Your building permit and worker’s risk insurance are based on it. It also varies considerably from estimator to estimator at the College, and in the end, it doesn’t relate to any real costing for the building. One can use a rough guide of a per square meter price, but this will also vary according to the kind of terrain – split level will cost more than building on a flat surface – and the kind of finish materials. As an example, a finished roof with galvanized steel sheeting will cost let’s say $2,500, as compared to $8,500 for recycled plastic tiles for the same area. That’s a huge difference. So the only way to get the cost factor nailed down is to do a detailed materials and labour estimate. Your architect will have someone who can do this, usually a student, and it will cost between $300 and $600, depending on how you negotiate it. It is well worth the money. Now starting out on this venture one really doesn't know anything about the capabilities of the contractors one gets as recommendations, so it is a time consuming job but necessary job to go through the process of checking them out. You need to visit their former buildings and ask the people if they had any problems with them. What quickly became obvious was that two distinct levels of contractor operations exist locally. One operates on an upper middle class, higher cost and quality housing, and the other is a distinct step down in quality. This latter group offers some possibilities as they are significantly cheaper than the first. But you pay for it in other ways: poor organisation and planning, inability to calculate quantities properly, areas of weakness in construction (as with electrical or plumbing work). Friends of ours took this path and they just reached completion recently, after a year and five months, and lots of stress, for a small 150 square meter, 2 bedroom house, with car port and pool. This should have been a seven month job, excluding the pool. 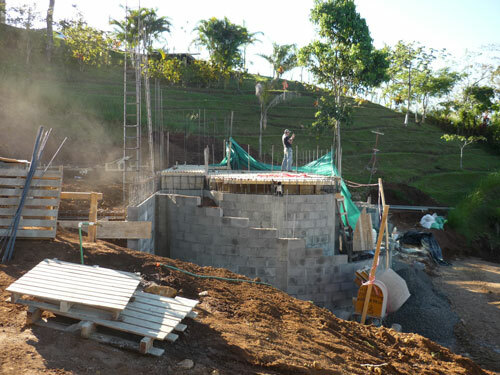 If you have lots of time on your hands, can speak Spanish well enough and can supervise and plan for the contractor, then maybe this is one way to go. 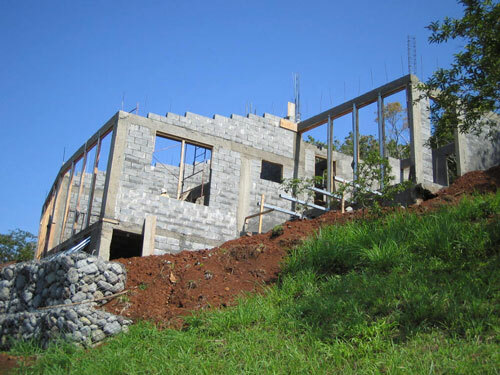 A little basic knowledge of local construction methods would help, because there are many pitfalls to do with the quality of the concrete being mixed, how much steel goes into the walls and so on. If they cut corners you have to know enough to know they are doing it! Of course there are no work guarantees here - when they finish the job you're on your own from that point on. If the contractually agreed amount of money runs out and they haven't finished, they could just walk away from the job. Any problems which come up are your problems to solve. I decided to look at the more professional level of operations to guarantee quality and speed of completion. Two of the contractors were locals and one from out of town and a non-Tico, whose family has been here for some 18 years. Before selecting these guys we went to their building sites and looked at their work, it's quality and progress. All three showed themselves to be extremely capable, well organised and competent, and having completed large upscale buildings. The out-of-towner came back with a price for a turn-key deal, with enough padding to supply quality finishes and materials. But at a cost double that of the others, which eliminated him as a possibility. One of the others wanted to provide labour only and not deal with buying and delivering materials, so I ended up with a price per square meter for the house for labour only. He provided me with a rough guide for completing the house to 'grey', but this later turned out to be seriously underestimated, and not that helpful. The last provided one cost for labour only and one for labour and materials, which was extremely high! We later went through the costs for materials in a detailed manner and it became obvious that the way to go was for him to provide labour only. This clearly left me with the role of project manager for the job. Interestingly, both of these contractors provided exactly the same amount for labour. This was Colones 110,000 per square meter, or about $195 at the day's exchange rate. Since I know what the cost of labour is locally, it seemed pretty high to me. I thought I was getting the usual 'gringo price'. On the other hand this house is an unusual design, a split level 2 bedroom house which wraps around a small hill, offering spectacular views to the mountains and two distant ocean views through a continuous wall of glass. To achieve this, the spaces are made in segments of a wedge, so there are no plain 90 degree angles. In other words, this house is not a straightforward build and will need more time and care to construct the design. Often the first price is an opening gambit only and some negotiating is expected to follow. This little dance can burn up a good few weeks, as you meet and re-meet to sort out various issues, and move a little closer to an agreement. Within about 10 days one of the contractors came back with a substantially lower bid, and we decided to go with him. We went to my lawyer’s office and signed a contract stipulating the work and amounts to be paid per week, the reserve payment and a host of other important details, such as who was responsible for the Social Security payments of the workers. Once all this was completed we launched into it!